Safa reports that the Al Aqsa Martyrs Brigades, the "military wing" of Fatah that operates mostly in Gaza but that sometimes shows up in full armed glory in the West Bank, has called on Palestinians "to engage with the Israeli occupation forces in Palestinian towns and villages in all legitimate and especially armed ways." The press release from the Abu Nidal Brigades makes a number of demands: O sons of the Arab and Islamic nation: Today we witness the summit of terrorism represented by the American Zionist administration and therefore we appeal to everyone to unite and support our resistance for the holiest holiness and the first qibla of Muslims [Jerusalem] and raise our guns as the only way to liberate our land. Today, Satan has come out against us, thinking that he will create a new reality, erase history and distort the doctrine. A verse of the Quran will not be shaken, and will remain the kiss of all the revolutionaries. The Al - Aqsa Martyrs ' Brigades Palestine Nidal Al Amoudi Martyrs Brigades: We call upon the PLO and the Palestinian leadership to assume the national authority and to cancel all agreements with the occupying state. We call on the resistance factions to start the battle for the complete liberation of Jerusalem and Palestine The Arab and Islamic nation should expel American and Israeli ambassadors who have relations with them The Arab and Islamic nation must support the option of armed struggle to liberate all of Palestine. To the steadfast sons of our steadfast people, we die and we live for the holiest and most holy place of the land of the first Qibla and the second Holy Haram, "Al-Quds Al-Sharif", the core of our faith and dignity. 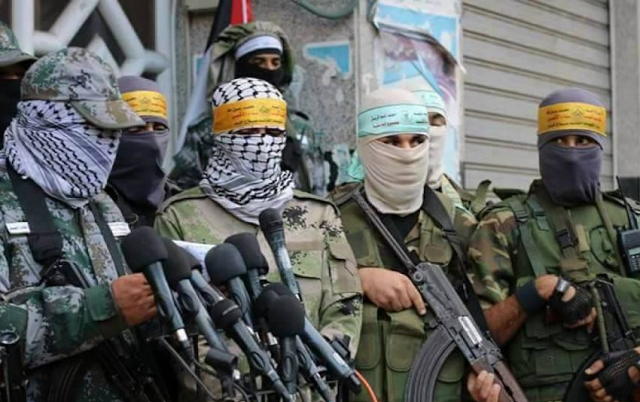 Remember, this group is part of Mahmoud Abbas' Fatah, and therefore considered by the world to be the moderate, peaceful alternative to Hamas.